October 8, 2016 4:00 p.m. Conditions on the Outer Banks are expected to deteriorate throughout the remainder of the weekend. Extremely heavy rains, high coastal water levels, storm surge and flooding will result in dangerous and life threatening conditions. Everyone is advised to stay indoors and travel to the area should be postponed until conditions improve. The National Weather Service predicts rainfall to intensify throughout the night and combine with tropical storm force winds that will continue through Sunday. In the event winds exceed 50 mph, ambulance crews may not be able to respond to calls for help. The forecast indicates that soundside flooding of up to 4 feet above ground is possible for areas prone to flooding, primarily on Hatteras Island. The combination of storm surge and flooding from the ocean and the sounds will combine with heavy rains to cause conditions that should be taken seriously. Dare County Emergency Management urges everyone to closely monitor the storm because any changes in the forecast can impact local conditions. Due to the high threat of rip currents and rough seas, everyone is advised to stay out of the ocean. The Town of Duck asks that residents and visitors keep trash and recycling bins under, against or inside your house to prevent added debris on roadways (DO NOT LEAVE BINS ON CURB). Citizens are encouraged to stay indoors, and extreme caution is urged if driving is absolutely necessary. Please avoid any areas on streets and highways that have a history of flooding. Be aware of the potential for sound-side flooding and ocean over-wash. Be prepared for possible power outages. In the case of high winds, please do not go outside and walk under tree canopies until winds subside and the storm has completely passed. In the aftermath of any storm which requires the removal of damaged or threatening trees from a private yard, before engaging any tree removal contractor, please (1) ask for company contact information and confirm references, (2) ask for evidence of insurance, and (3) get several quotes from different companies. Please be wary of any “hard sale” or pressure techniques. Cape Hatteras Electric Cooperative is ready to respond if Hurricane Matthew causes power outages on Hatteras Island this weekend. CHEC crews stand ready with prepared equipment and vehicles. The Cooperative has also staged a bucket truck and line crew in Hatteras Village in case Highway 12 becomes impassable. Hatteras Island residents and visitors should report all power outages to the Cooperative’s outage reporting number, 866-511-9862. If necessary, updates will be posted to CHEC’s Facebook and Twitter pages and broadcast on Radio Hatteras, 99.9 FM and 101.5 FM. To receive email updates directly from Dare County Emergency Management, register online at www.darecountyem.comand follow @DareCountyEM on Twitter. To stay up to date with the latest weather and traffic conditions in Dare County, download the free Ready NC App atwww.readync.org. For information regarding the status of roads and bridges, visit tims.ncdot.gov/tims or call 877-368-4968. For the most up to date information regarding the status of NC12, visit www.facebook.com/NCDOTNC12. Residents and visitors can contact Dare County Emergency Management by calling 252.475.5655 or visitingwww.darenc.com for updated information. The next Bulletin will be issued as needed, no later than Sunday morning at 10:00 a.m.
October 8, 2016 11:30 a.m.
For information regarding road conditions and closures, visit tims.ncdot.gov/tims. For the most up to date information regarding the status of NC12, visit www.facebook.com/NCDOTNC12. October 7, 2016 6:50 p.m. The most recent forecast from the National Weather Service remains fairly consistent with the previous track, with a slight shift bringing the storm closer to our coast. Dare County remains under a Tropical Storm Warning. The Storm Surge Watch has been extended further north along the oceanside and across portions of the southern Albemarle Sound. The combination of flooding from the ocean, sound and from heavy rains that is currently forecasted should be taken seriously. The National Weather Service is highly discouraging travel across northeastern North Carolina this weekend. As conditions deteriorate, road closures and travel restrictions are anticipated in Dare County, particularly for portions of Highway 12 on Hatteras Island. Because of dangerous travel conditions, visitors scheduled to arrive this weekend are encouraged to postpone travel until conditions improve. For information regarding road conditions and closures, visit tims.ncdot.gov/tims. For the most up to date information regarding the status of NC12, visit www.facebook.com/NCDOTNC12. The tropical storm force wind speeds forecasted for our area have increased slightly with the latest forecast and are expected to reach their peak Sunday morning. This leads to the potential for downed trees and power outages. By 5:00 pm today, all visitor services and facilities at Cape Hatteras National Seashore, Fort Raleigh National Historic Site, and Wright Brothers National Memorial will be closed until further notice. The Dare County Libraries will be closed on Saturday. If you are in a low lying area, or an area prone to flooding, relocate to higher ground. This is especially important for those with special medical needs. Residents in low lying areas should take action to protect personal property by moving to higher ground. This includes vehicles. Complete your disaster preparedness kits and other safety preparations now. Stay out of the ocean due to the high threat of rip current. The next update will be issued on Saturday morning. October 7, 2016The Dare County Control Group met this morning to review the latest information from the National Weather Service concerning dangerous conditions that are expected this weekend due to Hurricane Matthew. Dare County is now under a Tropical Storm Warning. According to the Weather Service, the combination of abnormally high coastal water levels, storm surge, and extremely heavy rainfall is expected to cause a dangerous and life threatening flooding event for the Outer Banks. The National Weather Service has indicated that we should expect ocean overwash in vulnerable areas. We should also expect soundside flooding of up to 4 feet above ground in areas prone to flooding, primarily on Hatteras Island. Because of dangerous travel conditions, visitors throughout Dare County are encouraged to depart today (Friday) and travel to the area should be postponed until conditions improve. For information regarding road conditions and closures, visit tims.ncdot.gov/tims. For the most up to date information regarding the status of NC12, visit www.facebook.com/NCDOTNC12 . The latest forecast also calls for tropical storm force winds with potential for downed trees and power outages. Vulnerable homes and buildings near tall trees have the potential for downed trees falling on them. To receive email updates directly from Dare County Emergency Management, register online atwww.darecountyem.com and follow @DareCountyEM on Twitter. The latest forecast from the National Hurricane Center continues to keep Hurricane Matthew south of the Outer Banks. Due to some uncertainty in the track for several days out, the local state of emergency declarations will remain in place to allow local officials the ability to implement protective actions should they become necessary. There are currently no travel restrictions or evacuation orders in place for Dare County and none are anticipated if the current track holds its course. Locally heavy rainfall and flash flooding are the primary concerns associated with the storm as it moves up the east coast. The most recent forecast indicates rainfall totals from 4 to 8 inches. With water levels already running above normal, it will not take much for low lying areas to receive nuisance type flooding. Very saturated ground may lead to downed trees and scattered power outages when winds increase late Saturday afternoon into Sunday. There will be minor to moderate storm surge flooding in areas prone to erosion and ocean overwash. The current forecast indicates that areas along the Pamlico Sound from Buxton south will be most prone to soundside flooding. As heavy rain and winds begin to impact the area, driving conditions may become hazardous, especially along NC 12 and other roadways prone to flooding. If you encounter water covering the road – turn around, don’t drown. It is never safe to drive or walk through flood waters because you will not know the depth of the water or the condition of the ground underneath. This is especially true at night, when vision is more limited. The threat of rip currents will remain high through the weekend indicating that the surf is dangerous for swimmers of all levels. · To stay up to date with the latest weather and traffic conditions in Dare County, download the free Ready NC App atwww.ncready.org. · Subscribe to receive email updates from Dare County Emergency Management at www.DareCountyEM.com and follow @DareCountyEM on Twitter. · View the latest watches, warnings and advisories from the National Weather Service at www.weather.gov/mhx. · For the most up to date information regarding the status of NC12, visit www.facebook.com/NCDOTNC12. The Dare County Control Group met again this morning to review Hurricane Matthew. The current forecast from the National Hurricane Center shows the storm tracking further south than previously predicted and away from Dare County. While this is an improved forecast for our area, it is too early to know for sure that this latest track will continue to hold its course. Because of the uncertainty of the forecast, residents and visitors are urged to remain vigilant and continue to closely monitor the storm because even moderate changes in the projected path could lead to significant impacts for Dare County. The state of emergency declaration will remain in place in case conditions change and protective measures become necessary. Dare County is already experiencing dangerous rip currents and rough surf conditions that are expected to continue. Dare County Emergency Management strongly urges everyone to stay out of the ocean. Dare County Public Works is operating on a regular trash collection schedule. Because of the winds that are anticipated in the coming days, residents are asked to roll up and secure their garbage cans as quickly as possible after pickup to reduce the risk of injury and property damage. Residents and visitors may contact Dare County Emergency Management by calling 252.475.5655 or visiting www.darenc.com for updated information. The 24th annual Outer Banks Parade of Homes begins this week on October 6th and goes through the 9th. 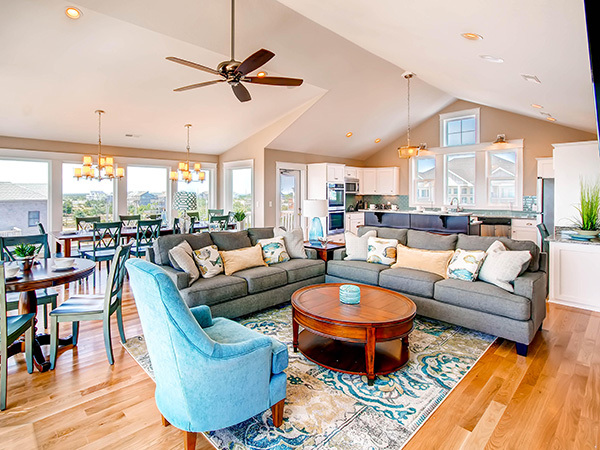 With 19 homes to tour from Corolla to Nags Head, participants will get to witness all manner of innovative custom features and finishes in a variety of price ranges with a special emphasis on the coastal environment. 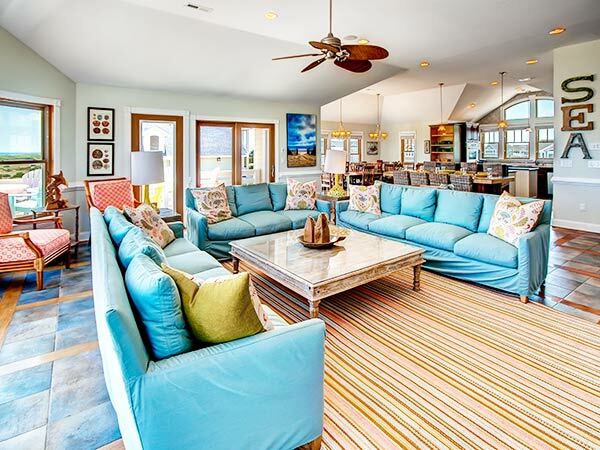 While the Home Parade doesn’t travel to Hatteras Island this year, the premier homebuilder of many Surf or Sound vacation homes has four homes on the tour. SAGA’s Signature homes provide families with the ultimate dream vacation experience. Each home is impeccably furnished and well equipped for your comfort and enjoyment, and the floor plan and personal home amenities meet homeowners and vacationers needs and exceed their dreams. These these homes have become favorites among our guests. We think you’ll see why. 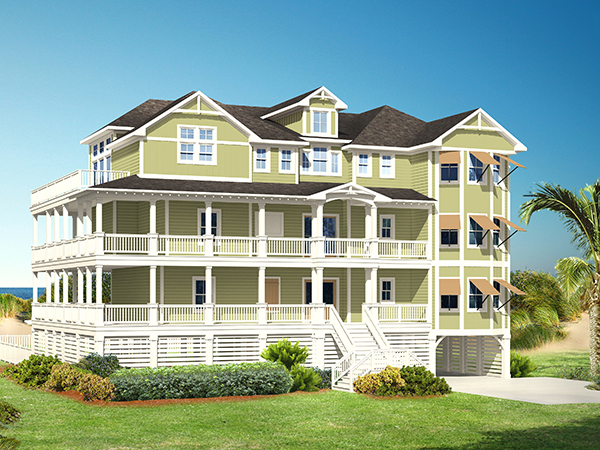 Brand new construction for 2017 on the oceanfront in Hatteras, Hatteras Grander is sure to provide a grand experience. Sweeping ocean vistas, 8 master bedrooms, vaulted ceilings and luxurious appointments will delight guests. Advanced reservations for this brand new estate are NOW OPEN – and it’s Dog Friendly! If you are seeking the highest quality experience for your family vacation this year, look no further. Located in Salvo’s exclusive North Shore Oceanfront Resort community, the ultra-luxurious SWEET DREAMS is brand new in 2016 and everything that you could dream of and more with top-of-the-line amenities, premium furnishings, opulent finishes and hi-tech electronics. The rooms are spacious and well-designed for your dream vacation and the beach is easily accessed via a path just outside the pool gate. Features theater room, game room, private pool, hot tub, elevator, fireplace and much more. Discover enchanting beach days and gorgeous ocean sunrises, while surrounded by luxurious amenities worthy of any five-star resort, with a stay at RISING SUN. Begin a busy beach morning with a stroll to the ocean, or with a splash in the dazzling private pool with inset kiddie pool and swim-up bar. Enjoy family parties poolside with the hot tub and expansive Tiki bar with ice machine, ice bath for drinks, fridge, ping pong table, TV and kids play area – all convenient to the charcoal and gas grills providing a complete outdoor entertainment area ideal for afternoon barbecues. This dog-friendly home features theater room, game room, private pool, 8 person hot tub, elevator, 2 fireplaces and much more. Recently Built in 2014, take a well-deserved TIME OUT in this beautiful oceanfront retreat located in the southern end of Salvo in the exclusive Hattie Creef estates. 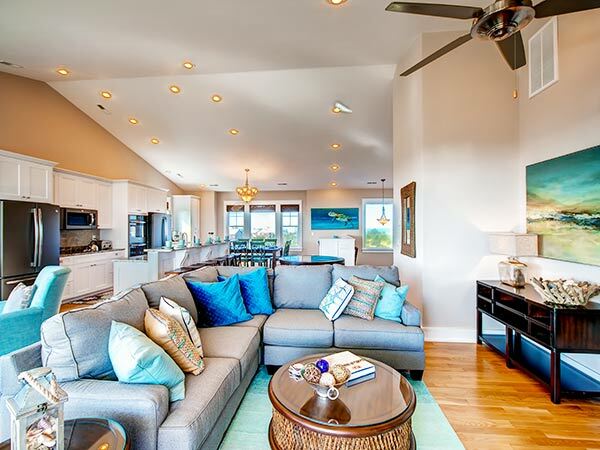 This 8 bedroom oceanfront features a spacious great room with vaulted ceilings and astounding blue ocean views. A large screen TV provides entertainment as the chefs in the family create culinary delights in the large open gourmet kitchen featuring granite countertops, custom cabinetry, two dishwashers, dual wall ovens and two full size refrigerators and a center island. The entire group can easily sit at the large dining table overlooking the Atlantic and the pool area through the expansive wall of glass. Step out onto the deck and sit back for casual conversation accompanied by the sounds of the sea and salt air breezes. This dog-friendly home features game room, theater room, private pool, elevator, hot tub, gas fireplace and much more! Let your vacation expectations reach new heights against the back drop of miles of blue ocean views, with a stay at magnificent MOONSHINE. Outside, you can enjoy long sunny days at the beach, or simply drift away while lounging by the glimmering private pool with inset kiddie pool and built-in swim-up bar. The spacious outdoor pool area makes it easy to enjoy an impromptu get-together with Tiki bar, ping pong table, kids play area, TV, a Weber gas grill, charcoal grill and plenty of elbow room for casual outdoor dining. On crystal clear evenings, relax under the MOONSHINE in the romantic hot tub, or step inside and enjoy a family movie night without leaving the home in the theater room with projection screen TV and stadium style seating. Nearby, start a billiards tournament in the expansive game room, designed with family entertainment in mind, and featuring a pool table, foosball, TV/DVD and wet bar with refrigerator, microwave and dishwasher. The sky’s the limit at spectacular Shooting Star where you’ll enjoy a vacation filled with luxurious amenities that rival any five-star resort. This shining sandcastle features four levels of indulgent vacation fun, beginning in the outdoor pool area, ideal for family parties that entertain well into the evening. With a sparkling private pool with inset kiddie pool and built-in swim up bar, convenient cabana half bath, and neighboring Tiki bar for refreshments, everyone will want to spend lazy afternoons by the poolside. 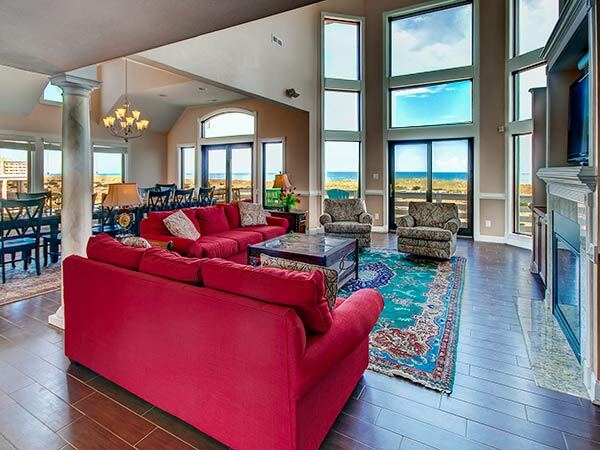 Enjoy luminous ocean views from the expansive great room with gas log fireplace, comfy seating area and home theater system with surround sound. The neighboring dining area provides an exceptional oceanfront dinner setting, and stepping up to the sun room offers the perfect venue for dining with the sea and stars in the background. Features include an elevator, game room, theater room, fireplace, private pool, tiki bar and 8-person hot tub, this home is also dog friendly! A State of Emergency has been issued for Dare County and all six towns following a meeting of the Dare County Control Group Tuesday afternoon. The emergency declarations are effective immediately and allow local officials to implement protective measures – including issuance of mandatory evacuation orders – that may be necessary as the hurricane approaches. While under the state of emergency, no reentry passes will be issued by Dare County Emergency Management. Hurricane Matthew is a strong, dangerous storm that, on its current track, is expected to bring significant to catastrophic impacts to Dare County. It is important for residents and visitors to stay informed and take necessary steps now to protect property. Assemble or restock your supply kit with essential supplies to sustain your family and your pets for up to three days. Preparedness information is available at www.readync.org. The Dare County Control Group will meet again on Wednesday to review updated forecast information and determine protective measures necessary to ensure public safety. Be prepared to evacuate if the order is issued. For up to date information, register to receive email alerts directly from Dare County Emergency Management atwww.darecountyem.com and follow @DareCountyEM on Twitter. The next update from Emergency Management will be issued by 2:30 p.m. on Wednesday, October 5. Dare County Emergency Management is closely monitoring the track of Hurricane Matthew and is asking residents and visitors to keep a close eye on the storm as it moves from the Caribbean towards the Atlantic over the next few days. Hurricane Matthew is a large, powerful storm and while it is too early to determine its exact track or impacts for our area, current forecast models indicate that the Outer Banks will receive impacts. Now is the time to prepare for a hurricane of this magnitude. Take your personal planning and preparations seriously — ensure that your emergency kit is properly stocked and that your emergency plan is ready to implement should protective actions become necessary. For preparedness tips and information, visit www.readync.org. If you or someone you know has special medical needs and may need assistance during an emergency, please call the Dare County Department of Health & Human Services, Social Services Division at 252.475.5500 to register. Subscribe to receive email updates from Dare County Emergency Management atwww.DareCountyEM.com and follow @DareCountyEM on Twitter. 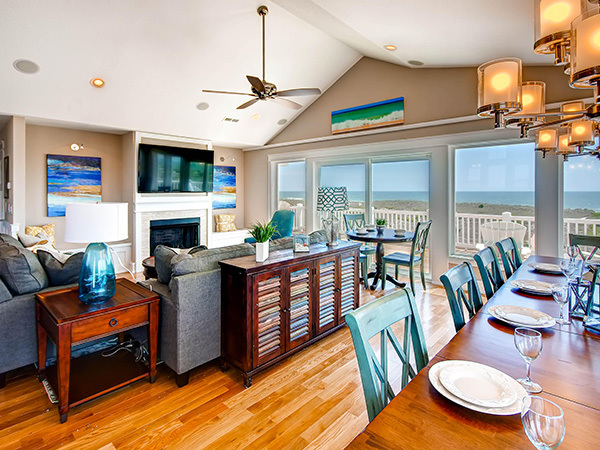 Vacation rental homes on the Outer Banks are known to be rented by the week, but did you know that most of our 450+ homes are available for partial week reservations? Have you ever felt like you need a vacation but just can’t stay for an entire week, or that one week just isn’t enough? We know how important vacation time is to families and we want you to have a vacation that fits your needs. Partial week stays at a percentage of the weekly rate are a great solution. SCHEDULE: Look at your calendar, talk to friends and family and decide what times you are available to visit. SEARCH: Look for homes that meet your criteria and have availability during the time you’d like to visit. 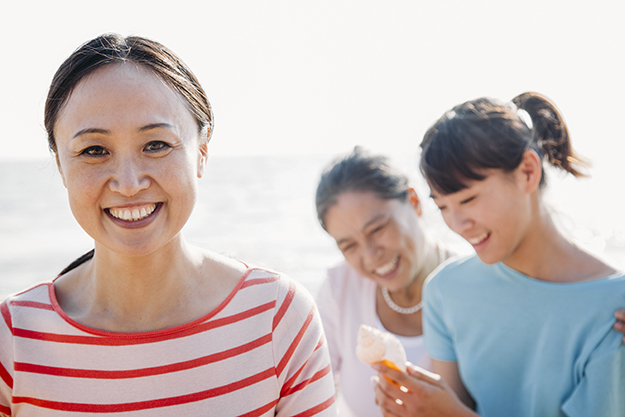 LIST: Create a list of your favorite homes or use our convenient Beach Bag feature to make one for you – you can even share it with friends! HIT THE BOOKING WINDOW: The partial stay booking window is within 14 days Labor Day through Memorial Day and 7 days during the Summer and Holidays. Once you’re in the window check to see what’s still available in your list! CALL: one of our knowledgeable vacation specialists (1-800-237-1138) to work out the details! 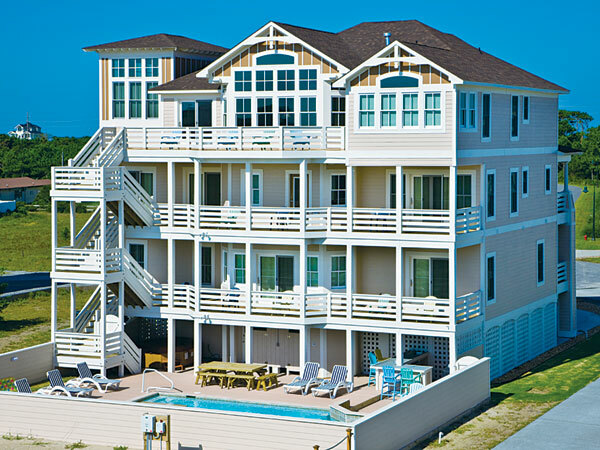 The Richardsons spend a week in July every summer in the same 8 bedroom oceanfront house. They love it. The kids spend all day rotating between the beach, pool and game room, and the home’s multiple levels allow all 15 family members to spread out and not ever feel crowded. No matter where they are in life they know they will have this annual family vacation to come back to. Two years ago, the heartache of leaving Hatteras Island at the end of vacation got to be too much and Tom and Sherry decided they needed to find a way to get back to their “happy place” before July. They called Surf or Sound Realty to talk about options for Fall and that’s when they learned about partial week rentals. They found out that after Labor Day a partial week rental can be booked in an available home within 14 days of arrival with the owner’s approval. Perfect. They aimed for a long weekend in October, went on the website at the end of September to search for available homes and called to book a 4 night stay in a beautiful 5 bedroom soundfront home with a fireplace and hot tub. July sunrises over the ocean and October sunsets on the sound. Life is good. The Talons make the trek to Hatteras Island from Quebec every April to take advantage of the stellar kiteboarding conditions. After two years they realized that a week wasn’t quite enough so now they book a two week stay or longer. Since they have flexibility in their time off, they will often add a few days to the front of their trip or after depending on what is available in the home (and what the wind forecast is). There is a three-night minimum for partial week stays and during peak summer seasons and holidays partial rentals can only be made 7 days in advance. Click here for complete description of the prices and policies.